Let’s get this straight. This article will show how to choose the best camping water filters. Therefore, the question is: “Are you a person who is into camping, or any other activity like hiking, fishing, and so on”? If so, I’m pretty sure you all understand that apart from camping tent and gear, water treatment is extremely important, especially to maintain our health when we are in the outdoors. However, for anyone who hasn’t experienced any outdoor activity like that, I will explain what I’ve just said. Not every water source out there is unsafe but remember that even a pristine-looking water source can totally make you sick. That’s the exact reason why we are here to help you. In this article, we will offer you guidance on how to determine the best camping water filters. Let’s get started. Before moving on to the main part of the article, it’s necessary for you to understand how water filters work. Therefore, you will know the exact reason why you should buy it for your camping trip. Overall, a water filter pushes water through a filter mechanically, straining out protozoa and bacteria. However, it doesn’t kill the virus, so don’t mistake a water filter for a water purifier. In details, every water filter has an internal cartridge or element. This is a component which has microscopic pores catching protozoa, debris, and bacteria. Over time, strained matter gyms up a cartridge’s pores, thus, the cartridge needs cleaning and replacing eventually. If you want to capitalize on the health benefits of water, a water filter is very important for you to draw from a clean source of water. There are about 2100 drinking water contaminants which can totally be in tap water, including some known poisons. Drinking contaminated water will probably result in epidemic disease in even developed countries. Bottled water cannot always provide a viable alternative to tap water. A point-of-use filtration system is the only way for us to ensure contaminant-free and pure water. Almost all municipal water treatment facilities are not able to control the outbreak of dangerous contaminants in tap water. The presence of toxic materials in drinking water can totally be the main cause of several types of cancer. According to the EPA, lead in drinking water led to about 500,000 cases of learning disorders in children every year only in America. Drinking clean, healthy is essential not only for children’s physical development but also their mental health. It’s even more essential for pregnant women to drink clean water as contaminated water can completely result in severe congenital disabilities. We all want to buy a portable water filter which is easy to carry during the camping trip or any other outdoor activity. This is an extremely important factor, especially when you know you will have to move all the time. Just imagine that you are going to set up a basecamp. In this case, a 0.1-micron water filtration system from Sawyer Products with the dimensions of 13.75 x 3 x 9.25 inches is totally fine. However, if you plan to hike long distances, then a Katadyn Pocket Water Filter is a perfect choice. This is because the item dimensions are 1.5 x 5.43 x 2.56 inches. 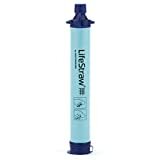 Or you can buy a small one like LifeStraw Personal water filter. Any camping water filter is already portable when you are going on a camping trip or any outdoor activity like that. It just comes down to your preferences and comfort. Therefore, instead of worrying about what to buy, just choose anything you feel will be easy to carry and use, that’s all. The output is also another important factor to consider when choosing a camping water filter. In case you are on a solo short-term trip, then this will not be a real matter. However, what if you’re going to provide water for a whole group or want to filter a lot of water? Well, in this case, it’s time to consider buying a pump water filter. This is because the filter can treat as little or as much water as you need very easily. Moreover, the gravity filter excels in this area, and it can collect and treat a huge amount of water in a short amount of time. Ceramic: an earthen material which is the same kind of stuff which our coffee mug is made out of. It has a long life and can be easily cleaned a lot of times before being replaced. Besides, a ceramic filter comes with a carbon core. Thus, it can remove chemicals from water quickly. Unfortunately, it is likely to get clogged. However, it is pretty easy for you to scrape clean. Hollow fiber: This filter is made up of hollow U-shaped micro tubes, therefore, it allows the water to go through small pores. Additionally, the water will also travel into the core, where the contaminants are eliminated. Fiberglass: This material is more fragile than ceramic but still very effective at removing particles. Silica Depth: With silica sand which is finely grained, this filter can work by using multiple levels of different sized grains, from finest to largest. This one can catch different sized organisms as well as particles effectively when water travels through the levels of density. With this filter, you need to drop the intake hose into the water source and the outlet hose into your bottle. After that, you work the pump. Some of these products directly thread to a reservoir or bottle. Process precisely the amount of water you want. You can replace the internal cartridge easily. Can completely pull water from shallow water sources and seeps. You need to have field cleaning for the cartridge quite often. Sometimes, it’s quite annoying to work the pump, particularly at the end of the cartridge’s lifespan. Bulk and weight are much greater than other products. To use this one correctly, you need to fill the reservoir, find a right place to hang everything up and just wait for the clean water. A lot of models come with an inline filter and a pair of reservoirs., However, the exactly provided water containers and setup can still vary. You will find it easy to process a large amount of water for your whole group. Unlike the previous one, you don’t have to do any hard work. Instead, gravity will do the work for you. You can replace the cartridge. It is difficult to find a place to hang the reservoirs. Treatment process normally takes you much longer than a pump filter. You frequently, need to have field cleaning for the cartridge. With fill-and-sip simplicity, this bottle has built-in filtration elements. Some products utilize the suction provided as the user sips from a bite valve. However, some other products work the same way as a coffee press. It is easy and simple for you to treat and drink water. You can easily replace the cartridge. This product is lighter, and it costs less than other water filters. The smaller the bottle, the less water. You frequently need to have field cleaning for the cartridge. This filter is just like a bottle filter except that users have to fill a small reservoir, then squeeze water through the filtration cartridges. The treatment is quite easy. Some products double as a straw-style filter or gravity filter. This filter is lighter, smaller and costs less than gravity and pump filters. The amount of water is limited by flask, reservoir and bottle size. Protozoa: this group includes the most common waterborne illnesses which are Cryptosporidium and Giardia. They are single-celled parasitic organisms that can result in intense intestinal problems. The symptoms appear anywhere from 2 days to even four weeks from ingestion. They can also live in cold water for a very long time like months. Viruses: Rotovirus and Hepatitis A are two common examples of viruses. They are extremely small. Thus, they aren’t strained out with almost all filters out there if the pore size is .02 microns. Bacteria: There are so many different bacteria, for examples, Campylobacteriosis and Dysentary. These pathogens can live well in water, but fortunately, we can easily filter out and treat them. This is because they are much larger than viruses and bacteria. After you know about the risks of water-borne pathogens, you have to learn how to prevent these illnesses with water filters. In details, a water filter can eliminate Cryptosporidium and bacteria, but not all viruses. The product can strain out particulate, and it can also improve the taste of the water. Most water filters out there have pore sizes which are not small enough to filter out tiny viruses. That’s the reason why you have to buy a water filter coming with an extremely small pore size. Another thing you should take into consideration is how heavy the treatment system is. In fact, common systems have drastic variance in weight, from a few ounces to even more than 22 ounces. This can totally be more or less concern of depending on your outdoor activities. For instance, if you are hiking a long distance, then you should buy a small and light water filter. However, when it comes to traveling internationally as well as setting up a basecamp, a heavier but highly effective filter is the best choice. As I mentioned above, the time it takes for different filters to treat water varies wildly. However, in general, you have to wait about 90 seconds for a liter, or just 40 seconds for 6 liters. If you are on a backpacking trip, then you will not want a filter that takes a long time to drink clean water. Instead, you need to have water as you go and don’t want to waste any time sitting around waiting for the water to be filtered. To me, an intermediate filter is enough for a personal filtration system. If you’ve just bought a pump filter and preparing for a multi-day camping trip, you should look for a pump which is field maintainable. Therefore, you can service the filter yourself in the backcountry in case it gets clogged. For instance, you need to scrap a ceramic filter quite often, but this is pretty easy for you to do. Many other pump filters are specifically designed so that you will find it easy to back-flush to remove clogs. However, it is still important to investigate how complicated this process can be, so you won’t get left helpless without water. Additionally, it is also worth noticing how long the filter lasts before it needs replacing. For example, a ceramic filter can filter up to about 2,000 liters while many other products can only filter up to about 500 liters. Nonetheless, you can easily buy replacement elements if your filter has run its course. The smaller the pore size, the more pathogens the product can strain out.. Furthermore, the smallest bacteria is just 0.2 microns, thus, the best filter should be about that size of even smaller to be more effective. Here are best camping water filters I want to present to you. However, before moving on to these products, I want to show you a quick reference guide. This is the first product I want to introduce to you. When it comes to water filters, Katadyn is one of the most popular brands for durability and reliability. However, what I love about this water filter the most is that it can pump much more water than many other ones out there. Another reason why I love this one is that it comes with a lifetime warranty, which is very rare now. – This pocket water filter is well-designed for any outdoor enthusiasts as well as international travelers. – The product is made of the highest quality construction, so it is ideal for long lasting use under different circumstances. – The silver-impregnated ceramic cartridge is very effective against protozoa and bacteria. – With a pore size of 0.2 mm, this product can totally filter all microorganisms larger than 0.2 microns. – This product comes with a lifetime warranty. – This filter is not light (20 oz), so if you’re going to move a lot, this is not a very smart choice. – Even when it’s easy to pump, you will have to pump it hardly, especially when you’ve already used it for a long time. – It’s quite bulkier than other products, so you will find it a little bit annoying to put it in your backpack. This is another type of camping water filters, a gravity one. To be honest, this is not my favorite, and I’ve never bought this filter once before, but I’ve already tried my friend’s once. You know what, the only thing that impressed me about this product is that it can filter 1.5 L per minute. That means in less than 2.5 minutes; you can have 4 L of water for your whole group. – It can filter very fast, 1.5 liters per minute. – It can eliminate almost all the bacteria and protozoa with the pore size of 0.2 mm. – You don’t have to do anything like I have to with a pump filter as the gravity does the all the work for you. – You can also find it easy to process large quantities of water for a whole big group. – The microfilter can be back-flushed quickly (in about 5 sec) to maintain its performance. – There are no moving parts as well as an assembly, so it’s very easy to use and carry. – You can totally filter on the go converting the clean water vessel into a pack with a drinking tube. – You only can use the cartridge for 1500 liters of water. – Sometimes, it’s quite difficult for you to find a place to hang the dirty side. – It can take longer for this filter to treat water when compared to a pump filter. – If there are seeps and shallow water sources, then it’s very challenging to use this gravity filter. This is another gravity water filter you can use for your camping trip. That means there is no pumping, no chemicals, no waiting, so no worry, right? But I’m pretty sure that you’re asking: “What makes this product different from other gravity water filters?”. Well, the main difference here is the pore size. While many other filters feature the pore size of 0.2 mm, this one comes with the 0.1 mm pore size. That means it can filter much more contaminants such as bacteria and protozoa than its counterparts. – 0.1-micron size helps this product remove much more bacteria and protozoa, producing cleaner and safer water. – It is easy for field cleaning with housing material which is made from food grade ABS plastic. – It can treat 2 L of water in about 1.5 minutes, without residual chemical taste. – The filter is the ideal of backpacking, group camping, padding, and even emergency preparedness. – You cannot use it forever. – Sometimes, it’s quite difficult to find a place to hand the dirty side of the ground. – It can’t eliminate dissolved solids such as chemicals and heavy metals. This gravity water filter is not special compared to the two previous ones that I’ve introduced to you. The only thing that sets this one apart from the others is a huge capacity, 4 liters of water. – Hundreds of tiny, hollow fibers enable the filter to treat water much more quickly than traditional methods. – With the weight of 10.75 oz, it’s easy for you to store, transport, dispense the water. – The gravity will do all the work for you. – Larger capacity allows this filter to produce more clean water for a whole group. – It can’t be used forever. It is undeniable that this product is the most commonly used by outdoor enthusiasts because of its portability and cost. You don’t have to do anything difficult like you have to with other methods. Instead, all you have to do is slurp directly from the water source. – The treatment is extremely easy, so the water is drinkable so much quickly. – It is lighter and costs less than pump and gravity water models. – It can also remove minimum 99.9% of protozoa and bacteria with 0.2 microns. – The product comes in a sealed bag. Therefore, it’s the best choice for storing for emergencies. – There are no chemicals and batteries used. – It can’t contain water, so you have to find a water source. – Field cleaning of the cartridge is often required. – It doesn’t have any replaceable cartridges. Maybe you think that there are a lot of things to consider when choosing the best camping water filters. However, if you’re really into outdoor activities such as camping and hiking, then you’ll know what to do to get clean water. I hope you guys found my buying guide and review helpful so that you can buy yourself the best water filter for your next trip. Chuck was born October 19, 1976. He grew up hunting on family land and fishing on the local lake. Chuck enjoys hunting and fishing for a living.